One thing most 30-something people in tech have in common is video gaming nostalgia. Generation X (and Generation i) can go on for hours discussing the merits of our favorite Nintendo games, our programming experience in school, and of course our beloved Ataris. Sure there were C64s and Amigas and such, but Atari’s 2600 and its successors were truly groundbreaking in the gaming world. You can still find a few here and there, working even, but to be honest the machine is a little more humble-looking than my memory has it. But Urchin Associates had the brilliant idea to preserve this piece of computing history forever… in 24-karat gold. Look at it. Is it not beautiful? Now, whether it works or not, I’m not prepared to say. That gold-plated cartridge (I wonder what game it is?) looks removable, and I doubt they plated over the I/O ports, so unless the system they used was bricked to begin with, it probably works just fine. 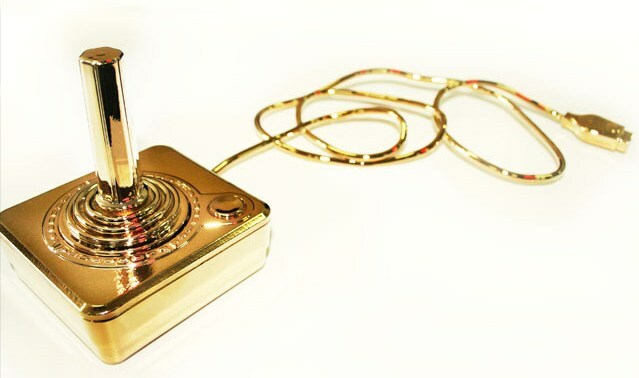 The controllers, however, may have lost a little functionality in the gilding process. The whereabouts of this art project are unknown, and no, I don’t think you can buy one. But it’s nice to know that it’s out there somewhere — like Eldorado, or Bigfoot.